Ray-Ban Bausch & Lomb ad found via Zone7Style. Ray-Ban Aviator for flying planes ($99 and up); Ray-Ban Outdoorsman for building forts ($139); Ray-Ban Shooter for taking aim ($144). There's no question that Ray-Bans are timeless, ageless and ubiquitous. I've been through my fair share of Aviators and Wayfarers, but I'd love to know: What are your favorite kind of Ray-Ban shades? Catty Clubmaster, tortise shell, hands down. Wear 'em every day. I wear gold Signets & tortoise shell Caribbeans, both classics, but not too obvious. I'm a Clubmaster girl all the way! Original wayfarers with black front, azure blue inside. I got a pair for my birthday last year and lost them almost a year to the date in February. I hunted down the same style and got them for my birthday again! I just had to! Can't live without them! i wear some RB4140. i don't know why they are called this they are a small version of a wayfarer. I have those exact aviators at the top. Love, love, love them. Am all about the ray-ban caravans...classic, yet modern stylish!!! I've just been clued in the Tom's (Shoes) makes sunglasses. Woah. I love my tortoiseshell Caribbeans, black and gold Clubmasters are a close second. now if only i kept up with things and didnt break sunglasses all the time ... i might actually consider buying a pair! I used to swear to wayfarers, and I still love my black ones. But lately I've been obsessed with my new cockpits. They are just perfect for my round face. I wear rb gold aviators every single day, and will forever. The Wayfarers that fold up into a little square, with green lenses. I used to be obsessed with my Wayfarers (tortoise with green lenses) but now I wear my Clubmasters almost exclusively. 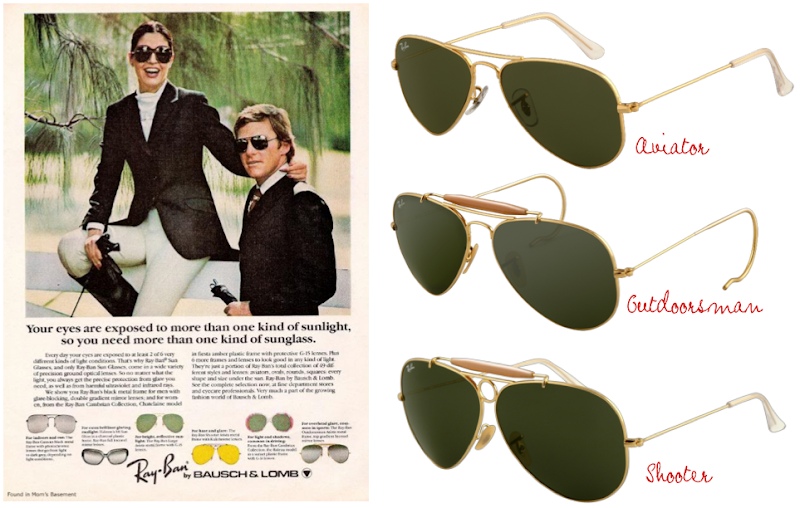 The classic aviators! I bought mine for fashion only (yes, I admit it) a couple of years ago and am now deeply, madly and truly in love with them! They flatter my square face more than any other frame and just feel so right. The sign of a true classic. Now a day,Sunglasses is very essential thing for all people to prevent from UV rays of sunlight.So everyone would get a good quality product of sunglasses. I buy Rayban Aviator from Siddharthopticals. Sunglasses buy from Siddharthopticals provides critical protection of my eyes from the sun’s damaging ultraviolet (UV) rays. Siddharthopticals offer highest quality contact lenses, Branded Eyewear, speech therapy in delhi, Buy Branded Sunglasses in delhi.